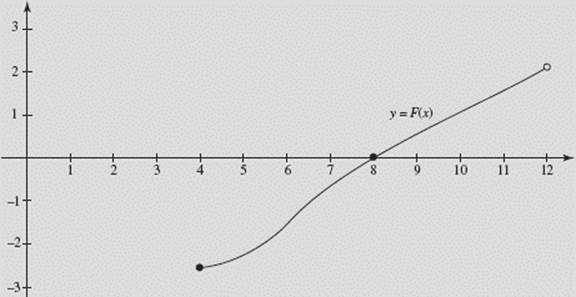 If f (x) ≥ 0 for all x on [a,b], we can interpret (2) in terms of areas as follows: The right-hand expression represents the area under the curve of y = f (x), above the x-axis, and bounded by the vertical lines x = a and x = b. The left-hand expression of (2) represents the area of a rectangle with the same base (b − a) and with the average value of f as its height. See Figure N6–17. CAUTION: The average value of a function is not the same as the average rate of change. Before answering any question about either of these, be sure to reread the question carefully to be absolutely certain which is called for. Find the average value of f (x) = ln x on the interval [1,4]. Find the average value of y for the semicircle on [−2,2]. NOTE: We have used the fact that the definite integral equals exactly the area of a semicircle of radius 2. The graphs (a) through (e) in Figure N6–18 show the velocities of five cars moving along an east-west road (the x-axis) at time t, where 0 ≤ t ≤ 6. 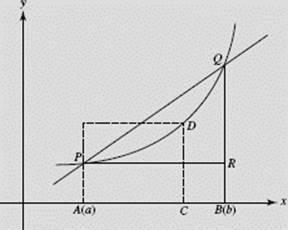 In each graph the scales on the two axes are the same. (2) with the greatest initial acceleration? (3) back at its starting point when t = 6? (4) that is furthest from its starting point at t = 6? (5) with the greatest average velocity? (6) with the least average velocity? (7) farthest to the left of its starting point when t = 6? 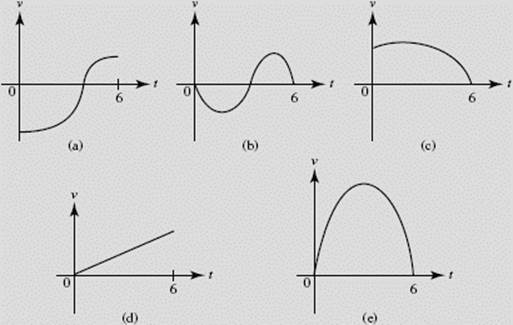 (1) (d), since acceleration is the derivative of velocity and in (d) v ′, the slope, is constant. 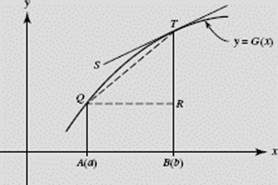 (2) (e), when t = 0 the slope of this v-curve (which equals acceleration) is greatest. (3) (b), since for this car the net distance traveled (given by the net area) equals zero. (4) (e), since the area under the v-curve is greatest, this car is farthest east. (5) (e), the average velocity equals the total distance divided by 6, which is the net area divided by 6 (see (4)). (6) (a), since only for this car is the net area negative. (7) (a) again, since net area is negative only for this car. (a) f (b) − f (a) = length RQ. (b) = slope of secant PQ. (c) F(b) − F(a) = = area of APDQB. 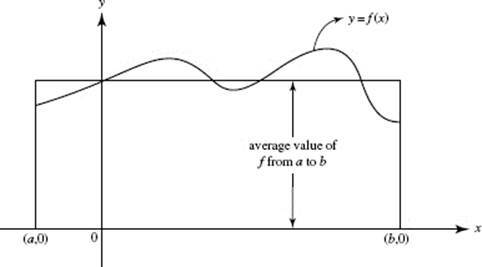 (d) = average value of f over [a,b] = length of CD, where CD · AB or CD · (b − a) is equal to the area F(b) − F(a). 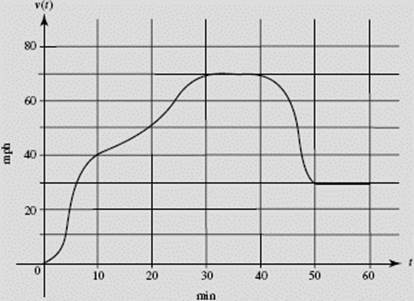 The graph in Figure N6–20 shows the speed v(t) of a car, in miles per hour, at 10-minute intervals during a 1-hour period. (a) Give an upper and a lower estimate of the total distance traveled. (b) When does the acceleration appear greatest? (c) Estimate the acceleration when t = 20. (d) Estimate the average speed of the car during the interval 30 ≤ t ≤ 50.
or 55 mi for the total distance. 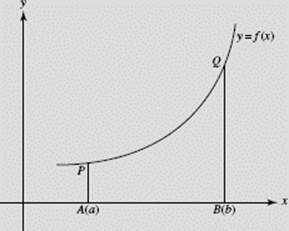 (b) The acceleration, which is the slope of v(t), appears greatest at t = 5 min, when the curve is steepest. (c) To estimate the acceleration v ′(t) at t = 20, we approximate the slope of the curve at t = 20. The slope of the tangent at t = 20 appears to be equal to (10 mph)/(10 min) = (10 mph)/ = 60 mi/hr2. 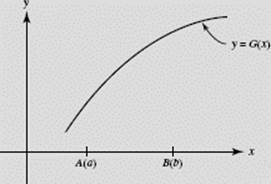 (a) g(b) is the slope of G(x) at b, the slope of line ST.
(b) is equal to the area under G(x) from a to b. (c) = G(b) − G(a) = length of BT − length of BR = length of RT. (a) What is the domain of F ? (b) Find x, if F ′(x) = 0. (c) Find x, if F(x) = 0. (d) Find x, if F(x) = 1. (g) Sketch the complete graph of F.
F is 2 ≤ ≤ 6, or 4 ≤ x ≤ 12. (d) For F(x) to equal 1, we need a region under f whose left endpoint is 4 with area equal to 1. The region from 4 to 5 works nicely; so and x = 10. (g) In Figure N6–22b we evaluate the areas in the original graph. In this chapter, we have reviewed definite integrals, starting with the Fundamental Theorem of Calculus. 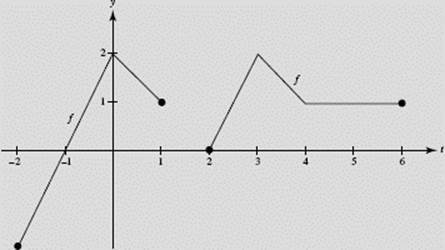 We’ve looked at techniques for evaluating definite integrals algebraically, numerically, and graphically. We’ve reviewed Riemann sums, including the left, right, and midpoint approximations as well as the trapezoid rule. We have also looked at the average value of a function. This chapter also reviewed integrals based on parametrically defined functions, a BC Calculus topic.